Each year, a group known as The Habitants du Theatiki organizes a reenactment of life around the time of The French and Indian War called The Gathering on the Theatiki. It’s quite an extraordinary event to visit. I just happen to be lucky enough to have The Theatiki (also known as the Kankakee River) run nearby where I live. This year, I went on the woods walk for the first time. We were quickly ambushed by the French and their allies and had to flee from the ensuing battle between while guarded by our British and Scottish escorts. I took a few photos of this event so you can see some of the highlights of the tip. If you live anywhere close to the Kankakee, IL area, I would highly recommend taking part of your weekend during the summer to visit the Gathering on the Theatiki. While you are there be sure to get some sassafras root beer and kettle corn, they sure to be some of the highlights of your trip. 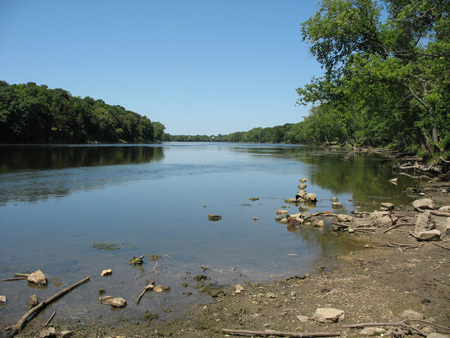 The Gathering on the Theatiki is a yearly event, held here in Kankakee county at the Davis Creek Annex of the Kankakee River State park. In 2008 the Theatiki will run from July 12th through the 13th. Most likely I will be there on the 13th. I still have a lot to update on this blog. More content is forthcoming.